40 Landscape Architect and Specifier News Five acres of a 140-acre farm in Austin, Indiana, were extensively renovated, but the project proved difficult because the site had been declared historically significant many years ago. John Charles Olmsted (1852-1920) and Frederick Law Olmsted Jr. (1870-1957), sons of Frederick Law Olmsted, designed the residence in the 1930s. These three Olmsted family members are considered pioneers of the landscape architecture industry. 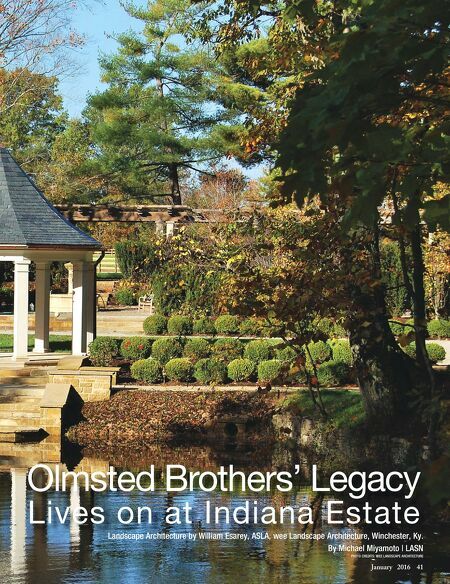 So the client wanted to revamp the site, but also "stay true," as much as possible, to the Olmsted brothers' original concepts, some of which were stored in archives. Everything was custom built, with the exception of the central fountain and the furniture for the pool patio. 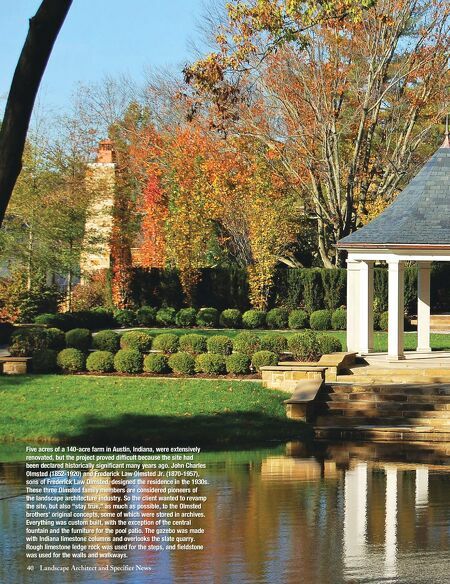 The gazebo was made with Indiana limestone columns and overlooks the slate quarry. Rough limestone ledge rock was used for the steps, and fieldstone was used for the walls and walkways.